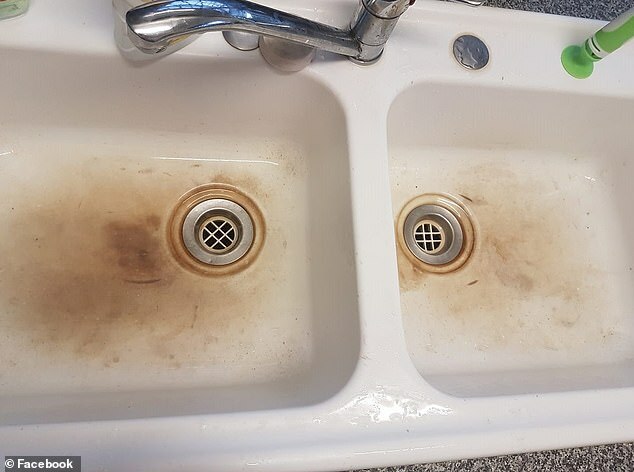 A Queensland mother looking to sell her home has revealed how she managed to completely remove stubborn stains from her sink. Posting in an Australian cleaning group on Facebook, the woman originally asked for advice as she was about to sell her house and wanted to clean up the filthy sink. She told group members that she had already tried Gumption but had no success. Asking other members for advice, the woman was quickly given all sorts of recommendations – from toilet cleaner to a ‘magic sponge’ and vinegar. ‘Harpic heavy duty crystals. I rinse the sink so it’s wet, cover in crystals and allow it to fizz. This should remove it if it’s build up,’ was one of the more unusual recommendations from one group member. ‘If it’s not build up I’d go a bleach product,’ said another. Another member from the group said the woman should fill the sink ‘with warm water and add Polident and let it soak a bit before scrubbing’. In recent months, the denture cleaner Polident has proven exceptionally popular with the Mums Who Clean group – who have used it to transform everything, from trainers to lounge chairs and tiles. 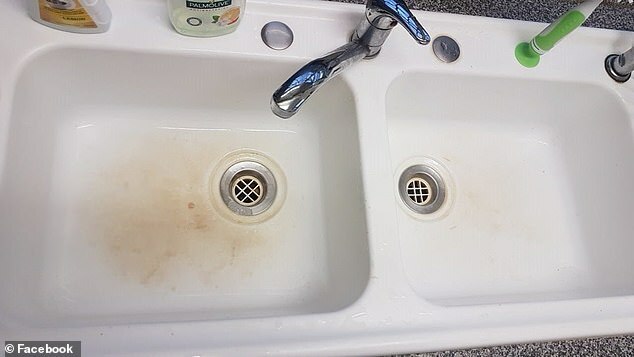 After reading through all of the advice, the woman decided to try one particular combination to make her sink look as good as new. She used Scalex, followed by a bleach soak, then Calcium Lime Rust (CLR) spray before finishing it with three soaks more of bleach, which left incredible results. 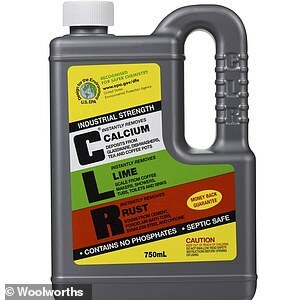 Calcium Lime Rust remover is available for $18 from Bunnings Warehouse. The finished product had people amazed at how good the sink looked. Her ‘after’ photo received more than 1,200 likes and 70 comments of praise. ‘This is so satisfying to see I can’t imagine how you feel looking at it’ one member said.